The Ontario Ministry of Tourism Culture and Sport has replied to my requests regarding the Province’s intentions now that Bill S-209 has passed. The Ministry advises that the Government is “reviewing the changes in the law and considering the best approach for the province“. 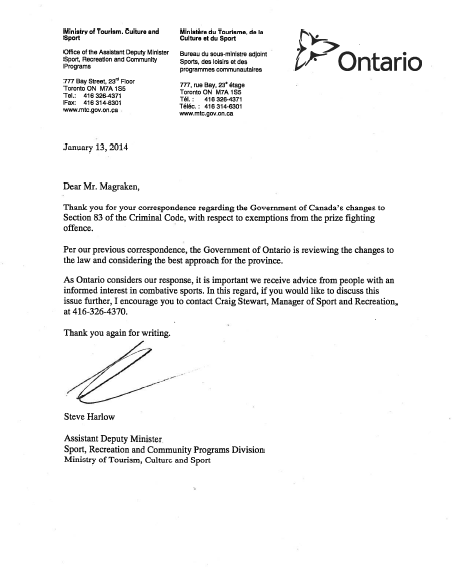 All those looking to have a hand in shaping the landscape of Ontario combat sports law ought to take advantage of this invitation to ensure your voice is heard in encouraging the Ministry to make informed changes to the law.